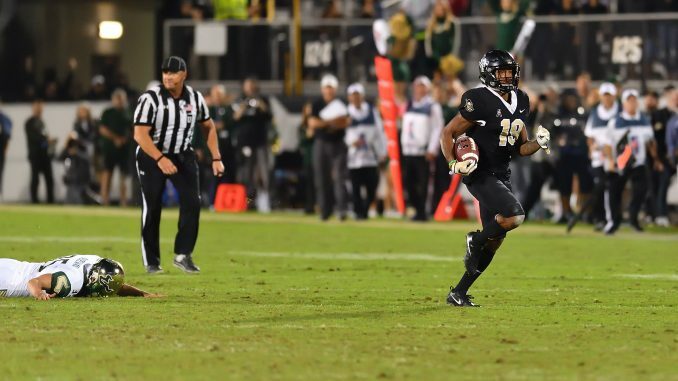 Every Thursday throughout the summer, Knight Sports Now has been taking a look at UCF Football’s best game in each of their years competing at the FBS level as part of a Throwback Thursday series. As we hit the final stretch, we’ll be turning back the clock every day leading up to the 2018 season. Today, we wrap up with 2017. UCF put together a historic season in 2017, going 13-0 to complete a winless-to-undefeated turnaround in just two years. The Knights dominated the early portion of their schedule, winning each of their first five games by at least 27 points. Even with the blowout victories early, Scott Frost and his team faced plenty of adversity throughout the fall. In September, Hurricane Irma cost them their bye week and a shot at earning a big ACC victory over Georgia Tech. As the year progressed, rumors started to swirl about Frost leaving to coach elsewhere. On the field, Navy and SMU tested UCF, with both games being decided by 10 points or less. Even with all of the challenges, the Knights headed into rivalry weekend with a perfect record and a chance to clinch a spot in the AAC Championship Game. War on I-4 rival South Florida, standing at 9-1, rolled into Spectrum Stadium on Black Friday with its own hopes of an AAC East Division championship. The two teams slugged it out in a game that is widely regarded as one of the best of the entire college football season. Early on, the Bulls were intent on putting the Knights in a hole. Less than two minutes in, Quinton Flowers hit Tyre McCants for a 47-yard touchdown. But the UCF offense responded quickly, driving 68 yards in nine plays to tie the game on a three-yard run by McKenzie Milton. The rest of the first quarter belonged to the Knights. Milton connected with Dredrick Snelson for a 16-yard touchdown after the defense forced South Florida to turn the ball over on downs. Then, after a missed field goal, UCF went 76 yards and took a 21-7 lead on a perfectly-executed option from Milton to Adrian Killins. For the next three quarters, the two teams took their fans and everyone watching on a wild roller coaster ride. The Bulls scored 13 straight in the second quarter to cut the Knights’ lead to 21-20 at halftime. They looked to be driving at the end of the half, but Mike Hughes came through with an interception of Flowers. It wasn’t the last time Hughes would have an impact on the game. Milton found Gabe Davis for a 23-yard touchdown to open the third quarter, but then it was South Florida’s turn to grab momentum— and the lead. Darius Tice ran for a six-yard touchdown to make it 28-27, UCF’s offense stalled and Flowers ran for a 24-yard touchdown to give the Bulls a 34-28 lead heading into the fourth quarter. The score remained locked at 34-28 for the first half of the fourth quarter. Things then got wild once again. Milton and Snelson linked up again, this time for a 45-yard score, to get the lead back for UCF. With just over two minutes to go, the Knights looked to ice the game on a 23-yard screen pass from Milton to Otis Anderson. The lead was up to 42-34 in favor of the home team, but it didn’t last long. A busted coverage on South Florida’s next drive led to an 83-yard touchdown pass from Flowers to Darnell Salomon. Seconds later, Flowers converted the two-point conversion by scrambling and finding a wide open D’Ernest Johnson in the end zone. The game was tied again, but that also didn’t last long. Everyone knows what happened on the ensuing kickoff. Hughes, who had the crucial interception in the second quarter, fielded the kick at the five and worked his way through the Bulls’ kickoff team. Around midfield, he broke free and had nothing but space ahead. The 95-yard kickoff return gave UCF the lead and ultimately the division title. Flowers had one last chance to answer, but Richie Grant knocked the ball loose from Mitchell Wilcox after a completion to set off another huge celebration in Orlando. Milton’s night was excellent. He converted on 29 of his 44 passes for 373 yards and four touchdowns while rushing for 56 yards and a touchdown on 11 carries. Snelson’s two touchdowns were huge, as was the combined effort of Killins and Anderson. On the other side, Flowers was brilliant. He was 24-of-45 for 503 yards and four touchdowns through the air and added 102 yards and a touchdown on the ground. McCants was his top target, catching nine passes for 227 yards and a touchdown. The wild victory over South Florida was just the start of an insane month for UCF. The Knights followed with a shootout double-overtime win over Memphis to win the conference title. After that, they capped off their perfect season in Atlanta with a 34-27 win over No. 7 Auburn. Truthfully, any of UCF’s final three games would be a fair pick for the team’s best of the 2017 season. However, the other two can’t happen without the first one. Plus, it was an emotional, iconic victory that Knights fans will hold over their rivals forever. Therefore, it earns our pick for the best game of the 2017 season. Each installment of Knight Sports Now’s summer throwback series can be found here.